Notable Extras: 2 featurettes (Partners in Crime: Clint Eastwood and Angelina Jolie, The Common Thread: Angelina Jolie Becomes Christine Collins). What? Save $5 when you buy Changeling and Flash of Genius. 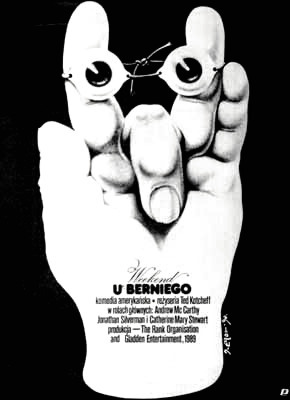 Well Medicated put together a fine collection of 50 Polish movie posters, including the cute interpretation above of Rosemary’s Baby. I’ve included a few of my favorites here. And for contrast, I’ve attached the new domestic one-sheet for Leonardo DiCaprio’s Body of Lies—one of the blandest posters I’ve recently come across. Can’t say I prefer the foreign version of Weekend at Bernie’s, but that’s to be expected, no? For more info on the artists behind these works, or to purchase, visit the great site, PolishPoster.com. Thanks to ‘rio for the tip. Remember that teaser trailer that was attached to The Dark Knight? No, not Watchmen. Nope, not Terminator. I’m talking about the film starring Leonardo DiCaprio and Russell Crowe. Body of Lies follows a former journalist who is hired by the CIA to track down an Al Qaeda leader. You probably didn’t get that much from the first trailer, I know I didn’t. Thankfully, Warner Bros has released a new full length trailer which gives you a much better sense of what this Ridley Scott film is about. Watch it now below, and as always, tell me what you think in the comments. Watch the trailer in High Definition on Yahoo. Body of Lies hits theaters on October 10th 2008. Warner Bros has also provided us with the first photo from Ridley Scott‘s (Gladiator, American Gangster) big screen adaptation of David Ignatius’s novel, Body of Lies. The film stars Leonardo DiCaprio as Roger Ferris, an injured former Iraq War journalist who is hired by the CIA to track down an Al Qaeda leader. And the screenplay is written by William Monahan, who won the Oscar last year for The Departed‘. The film also stars Russell Crowe and Carice van Houten. A tale of counterterrorism from an author who “ranks with Graham Greene in his knowledge of espionage and the human heart” (Publishers Weekly). Roger Ferris is one of the CIA’s soldiers in the war on terrorism. He has come out of Iraq with a shattered leg and an intense mission-to penetrate the network of a master terrorist known only as “Suleiman.” Ferris’s plan for getting inside Suleiman’s tent is inspired by a masterpiece of British intelligence during World War II: He prepares a body of lies, literally the corpse of an imaginary CIA officer who appears to have accomplished the impossible by recruiting an agent within the enemy’s ranks. This scheme binds friend and foe in a web of extraordinary subtlety and complexity, and when it begins to unravel, Ferris finds himself flying blind into a hurricane. His only hope is the urbane head of Jordan’s intelligence service-a man who might be an Arab version of John le CarrÃ©’s celebrated spy, George Smiley. But can Ferris trust him? Body of Lies will hit theaters in the Fourth Quarter of 2008.